The Hollywood classic "The King and I" is revived as a Broadway musical in New York. The classic movie is still remembered by many Koreans with the superb performance by Yul Brynner and Deborah Kerr. Yet, the newest version of musical "The King and I" isn't only in Broadway. It is now soon landing in Korea as part of its world tour with the original staff. Novotel Ambassador Gangnam welcomes the musical and offers a special package that features two tickets to the musical and one romantic night with various guest benefits. The package has two options (1&2) available with both including two R-seat tickets (worth over 200,000won) to the musical to catch the truest performance of "The King and I" and various package offers make your stay even more meaningful with your partner. The package includes free breakfast buffet at either the bistro or executive floor and free access to swimming pool, fitness club and sauna (package 2 only). "The King & I" package offers a variety of package benefits at the cost of tickets to the musical. Reserve your package now and be part of this amazing display of classic performance with someone special. 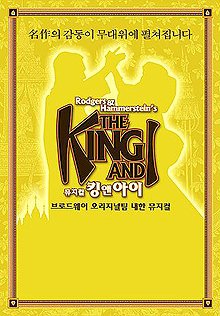 - 2 R seat tickets to Musical "King & I"